Western Australian artist, who is behind the widely successful Karijini show at Koskela. Jane Tangney’s Karijini exhibition opened in the Koskela Gallery on Saturday, 28th July, and had almost sold out within hours. Customers who got their hands on an advanced copy of the catalogue purchased artworks over the phone or online without seeing them in person. It was the fastest selling show Koskela has ever had. Her heavy impasto paintings and works on paper appealed equally. It seemed everyone wanted to get their hands on a piece of Jane’s stunning and, at times, haunting interpretation of the Karijini National Park and and ghost town of Wittenoom in Western Australia. We chatted to the softly spoken artist to find out more about her art practice and the personal significance of the Karijini show. 1. What was your path to becoming the artist you are today? I went to six different primary schools. Drawing was a constant in my life. It helped me assimilate as the shy, ‘new kid’. I went to one high school – a public school with an amazing art scholarship program that involved going to school on Saturdays just to do art. Practicing artists taught these classes. They were really different to the weekday teachers, with some smelling like turps and tobacco while others were fashionably 80’s. I looked up to them all and they probably influenced my decision to study fine art at university. After graduating I travelled and worked overseas, where I saw famous paintings in the flesh for the first time. During this time I worked in journals. Occasionally I look at them now and I’m amazed at the energy and enthusiasm of my younger self. I scribbled down thoughts and drew everywhere I went. Most of the writing is really cringe worthy, but they’re still keepers. I’ve kept up a consistent art practice since then – quietly and steadily going about my work with other creative strings to my bow. 2. What part of your art practice brings you the most joy? A few years ago a young woman introduced herself to me at an exhibition. She said her Mum had purchased a painting of mine many years ago and it still took pride of place in her Mother’s home. She described how she had grown up with this piece and how it was a part of her family. I found this very moving. I also derive joy from being out in nature, drawing and painting in my sketchbook. A sketchbook is a place where I can try things out and fail – a place where I can scribble out an idea or play with colour. Without them, I would find the blank canvas very daunting. 3. What influences your work? The internet has changed everything, making the world far more intimately connected. I regularly look at international art, yet at the risk of sounding parochial I am drawn back to my own culture and the culture of Indigenous Australians. I read somewhere a while back that globalisation is shaking off the ‘provincialism problem’ in Australian art. For me, provincialism is a choice. There is nothing more inspiring and authentic than an artist immersed in their own surroundings, telling their own stories. Australian artists such as Rosalie Gascoigne, Churchill Cann, Steven Harvey, Jenny Sages and Kevin Lincoln come to mind when I think about artists living and working within my lifetime who have been influential to my practice. 4. What is the theme for your show at Koskela? The works at Koskela are inspired by a road trip to Karijini (Banyjima name for the Hamersley Range) situated in the Pilbara region of WA. Within the range is the stunning Karijini National Park and ghost town of Wittenoom – a place of significance to my grandparents and dad who moved there from 1947 to the mid 1950’s, unaware of the health risks this newly established asbestos mining town would later pose. Pop died from Wittenoom’s deadly dust when I was a baby. Nan was a nurse/midwife there – later settling in Broome. 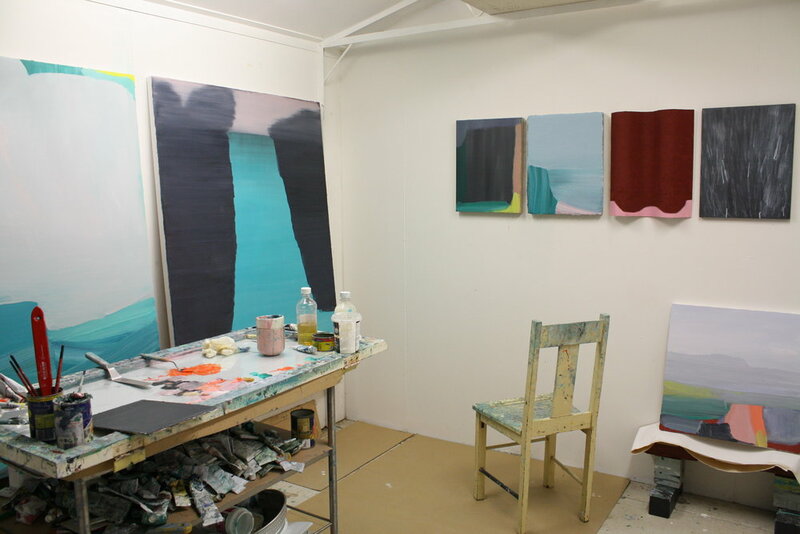 The works are about colour, open space, deep gorges, shadows, lungs/breath, silence and connection to family now deceased. Nan was lucky. She lived well into her nineties despite using asbestos tailings as mulch around her Wittenoom roses. She was an optimistic, capable woman who instilled in me a great respect for Aboriginal people’s knowledge, resilience and humour. She would be happy to see my work displayed at Koskela beside the remarkable Tjanpi Desert Weavers – many of whom are from the Ngaanyatjarra Lands of WA. 5. What do you love most about your home state of Western Australia? I love the raw and bewildering beauty of Western Australia. Being so vast it is a place of contrasts from red deserts to beaches with sand so white and fine that it squeaks when you walk. I had not explored Karijini National Park thoroughly until this recent field trip. Although it isn’t a secret spot, it is high on my list of places to see.